When a preprogrammed remote offers multiple categories of very similar device types, it can be difficult to narrow down exactly which is the most appropriate one to use. Should my cable box be considered an ordinary “cable box”, a “cable box/PVR” or a “PVR”? Does it even make a difference? More of an issue is what happens when an entire device category pans out. For example, I have a Sony PS3 game system, controlled by any number of possible add-on gadgets that employ standard Sony PS2 and DVD player codes. For this I selected the most appropriate category during the initial selection stage: “Game Console”. However with that choice I’m later presented with dozens upon dozens of brand names that seemingly have nothing to do with game consoles or game console accessories. Deciding to choose “Sony” as a safe bet, I was presented with a list of matching models that have absolutely nothing to do with controlling a PS3 or PS2 – there were even televisions in there! If I then tell the wizard that nothing matched, it insists on downloading the entire list of non-matching codesets to the remote for manual testing... which of course fails to improve the situation. Back at the wizard, my only options were to pick a new brand name, or learn everything manually. It’s altogether impossible to change the device type to something else. Full or even fractional database searches are also out of the question – if you inform the wizard that none of the listed brands look right, the only option offered is full manual learning. UEI’s code database is one of the best on the market, but the inability to perform even the most basic of code searches means that new “house brands” may be difficult or even impossible to configure without resorting to manual learning, even though functional codes will likely exist somewhere in its depths. While a remote control that combines the extensiveness of UEI’s code database with the ease of computer programming in a continuously updated online format should be a dream come true for finding almost any code, with the Xsight this was not to be the case. Chances are you’re going to need to resort to at least a little code learning, which really shouldn’t be a big deal – provided you have the original remote to learn from! In the case of learning entirely new devices, the Xsight abandons simplicity and resorts to what would normally be considered “the alternative method”. 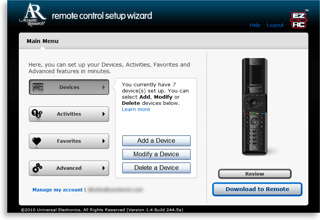 Once you’ve selected that you’d like to learn a device, the wizard downloads your configuration as-is to the remote. The wizard’s instructions then say to “go to Home / Settings / Learn a function / Learn a new device ... and follow the instructions that appear on your remote’s screen”. Following these steps, the Xsight proceeds with the regular on-remote device wizard – with everything that had already been entered on the computer about that device casually discarded. More disappointing is that when creating a new device, all on-screen buttons must be learned and subsequently labeled using the remote’s built-in interface. So I have a not-inexpensive computer programmable remote, hooked up via a robust USB connection to a computer with a keyboard designed solely for the purpose of typing, and the Xsight expects me to sit there tapping out potentially dozens of labels in all capitals using a 10-digit numeric keypad? Combine this with the already lengthy steps involved with learning on-screen buttons and the inability to pick button positions at the time of creation, and any amount of learning could turn into a frustrating chore. Once you’ve stuck it out and learned an entire device, the remote automatically prompts you to re-connect it to your computer where the entire configuration is then uploaded... complete with a harmless but nonetheless disconcerting warning about deleting the existing configuration stored on the website. The wizard also asks you to enter some detailed information about the device, for future addition to UEI’s preprogrammed database. 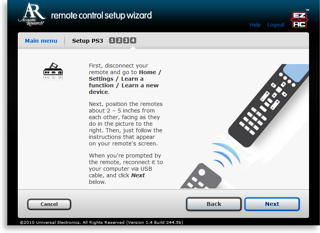 After all devices have been configured, the wizard places you at the EZ-RC home page which has four simple options: “Devices” to add new devices; “Activities” for adding common tasks such as “Watch a Movie” or “Listen to a CD”; “Favorites” for personalized favorite television channel icons; and “Advanced” for everything else including button customization and macros.